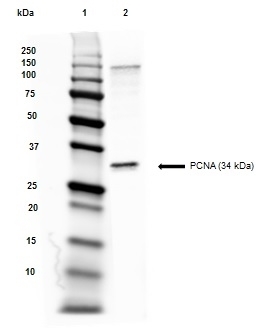 Western blot analysis of HeLa Nuclear Extract probed with Mouse anti Human PCNA (MCA1588). Staining of KM-H2 cells with Mouse anti PCNA:FITC (MCA1558F) permeabilized with Leucoperm (BUF09) and methanol. K562 whole cell lysate was run under reducing conditions on SDS PAGE using the Bio-Rad V3 system and transferred to a PVDF membrane. Mouse anti Human PCNA (MCA1558) was used as primary antibody followed by a Goat anti Mouse IgG (H/L):HRP secondary antibody at a dilution of 1/10,000 (STAR207P) was used as the secondary antibody. Visualization was carried out using the Bio-Rad ChemiDoc with automatic exposure in grey scale. K562 whole cell lysate was run in lane 2 under reducing conditions on SDS PAGE using the Bio-Rad V3 system and transferred to a PVDF membrane. Bio-Rad Precision Plus molecular weight marker was run in lane 1. MCA1558P Mouse anti Human PCNA:HRP conjugate was used as a direct label at a 1/1000 dilution. Visualization was carried out using the Bio-Rad ChemiDoc with automatic exposure in grey scale. Development of epidermal scales during reptilian embryogenesis. From: Di-Poï N, Milinkovitch MC. Sci Adv. 2016 Jun 24;2(6):e1600708. This image is from an open access article distributed under the terms of the Creative Commons Attribution License. 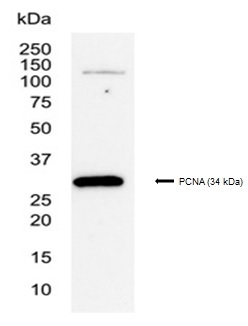 Mouse anti PCNA antibody, clone PC10 recognizes the proliferating cell nuclear antigen, also known as PCNA or cyclin. PCNA is a 261 amino acid ~28 kDa nuclear protein vital for cellular DNA synthesis at the replication fork (Li et al. 1995) through its interaction with FEN1 (Wu et al. 1996). PCNA is the auxilliary protein for DNA polymerase δ (Bravo et al. 1987). PCNA is highly conserved between mammalian species and other vertebrates. Clone PC10 has been used for the detection of PCNA in a number of species including human, rat, mouse (Park et al. 2008), chicken (Franz-Odendaal 2008) and abalone (Harris et al. 2006). 1 Membrane permeabilisation is required for this application. Bio-Rad recommends the use of Leucoperm™ (Product Code BUF09) for this purpose. Where this antibody has not been tested for use in a particular technique this does not necessarily exclude its use in such procedures. Suggested working dilutions are given as a guide only. It is recommended that the user titrates the antibody for use in their own system using appropriate negative/positive controls. This product does not require protein digestion pre-treatment of paraffin sections. This product does not require antigen retrieval using heat pre-treatment prior to staining of paraffin sections. Mathews, M.B. et al. (1984) Identity of the proliferating cell nuclear antigen and cyclin. Ogata, K. et al. (1985) Purification and N-terminal amino acid sequence of proliferating cell nuclear antigen (PCNA)/cyclin and development of ELISA for anti-PCNA antibodies. J Immunol. 135 (4): 2623-7. Garcia, R.L. et al. (1989) Analysis of proliferative grade using anti-PCNA/cyclin monoclonal antibodies in fixed, embedded tissues. Comparison with flow cytometric analysis. Am J Pathol. 134 (4): 733-9. Landberg, G. et al. 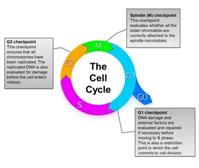 (1990) Flow cytometric multiparameter analysis of proliferating cell nuclear antigen/cyclin and Ki-67 antigen: a new view of the cell cycle. Exp Cell Res. 187 (1): 111-8. Wilson, G.D. et al. (1992) Flow cytometric characterisation of proliferating cell nuclear antigen using the monoclonal antibody PC10. Eur J Cancer. 28A (12): 2010-7. Prosperi, E. et al. (1993) Proliferating cell nuclear antigen complex formation induced by ultraviolet irradiation in human quiescent fibroblasts as detected by immunostaining and flow cytometry. Exp Cell Res. 205 (2): 320-5. Elsässer, H.P. et al. (1994) Growth of rat pancreatic acinar cells quantitated with a monoclonal antibody against the proliferating cell nuclear antigen. Cell Tissue Res. 276 (3): 603-9. Buggins, A.G. et al. (2001) Microenvironment produced by acute myeloid leukemia cells prevents T cell activation and proliferation by inhibition of NF-kappaB, c-Myc, and pRb pathways. Kapitonova, M.Y. et al. (2010) Immunohistochemical characteristics of the hypophysis in normal conditions and chronic stress. Neurosci Behav Physiol. 40: 97-102. Franz-Odendaal, T.A. (2008) Toward understanding the development of scleral ossicles in the chicken, Gallus gallus. Hashimoto, Y. et al. (2010) Rad51 protects nascent DNA from Mre11-dependent degradation and promotes continuous DNA synthesis. Nat Struct Mol Biol. 17: 1305-11. Jenkins, H. et al. (1993) Nuclei that lack a lamina accumulate karyophilic proteins and assemble a nuclear matrix. J Cell Sci. 106: 275-85. Park, J.H. et al. (2008) Gastric lesions and immune responses caused by long-term infection with Helicobacter heilmannii in C57BL/6 mice. J Comp Pathol. 139: 208-17. Izhak, L. et al. (2012) Dissecting the autocrine and paracrine roles of the CCR2-CCL2 axis in tumor survival and angiogenesis. Fenton, M. et al. (2001) Cellular senescence after single and repeated balloon catheter denudations of rabbit carotid arteries. Arterioscler Thromb Vasc Biol. 21: 220-6. Guzera, M. et al. (2016) In Vitro Influence of Mycophenolic Acid on Selected Parameters of Stimulated Peripheral Canine Lymphocytes. PLoS One. 11 (5): e0154429. Neuroscience and Behavioral Physiology. 46 (1): 100-5. Nakatsuka, M. & Kumabe, S. (2018) Histological Alterations from Condyle Repositioning with Functional Appliances in Rats. J Clin Pediatr Dent. May 15 [Epub ahead of print]. Di-poï, N. & Milinkovitch, M.C. (2016) The anatomical placode in reptile scale morphogenesis indicates shared ancestry among skin appendages in amniotes. Sci Adv. 2 (6): e1600708.